Liz Henry was unable to attend WisCon. Michelle Murrain has been added as a panelist. Naomi Kritzer is no longer a panelist. Jaymee Goh has been added as a panelist. Saba Razvi was unable to attend WisCon. 101 Where Is WisCon Going? s.e. smith is no longer a panelist. Bronwyn B., Kristin Livdahl, and Sandy Sasha_feather have been added as panelists. http://www.eatstreet.com is offering us %10 off through May 25 with the code WCON10. Good for any order! 8 a.m.: Con Suite opens. Childcare opens. 10 a.m.: Children’s Programming begins. Dealers’ Room opens. 11:15 a.m: Tiptree Bake Sale begins. 11:45 a.m.-12:30 p.m.: Childcare closes for lunch. 6 p.m.: Childcare closes. Dealers’ Room closes. Art Show Award voting ends. 11 p.m.: Con Suite closes. Because of the hotel’s sixth floor remodel, many parties have moved to the second floor and because of the terms of their liquor license, we are unable to serve alcohol on the second floor. We will have a cash bar at Opening Ceremonies and the Karaoke Party on Friday night. Not only that, the Karaoke Party has free beer! We will also have a cash bar Sunday night at the Dessert Salon. 6th floor parties and room parties can still serve alcohol. You can get drinks at the bar. We love the bar! Not only are they friendly as all get-out, but they have a special drink menu with many drinks put together just for us. See the Drink Menu for more info! You can buy your own. There’s a liquor store on State Street and a second liquor store just down Gorham Street. Of course, if you do you still can’t serve it to anyone on the 2nd floor. We are probably just as sorry as you probably are, believe me! Finally, please remember that we cannot have alcohol outside on the sidewalk or in the smoking area so if you have a drink and find you need a smoke, please find a place to set your drink before heading out there. It’s another way the hotel can lose its liquor license. You may have noticed that this year the con suite doesn’t have hot dogs. If you are suffering from HDWS (Hot Dog Withdrawal Syndrome), your best fix may be the “OSS” restaurant at 910 Regent ST. It’s about 1.2 miles from the Concourse, and has no parking, so your best bet might be either a #6 bus or a Madison B-cycle rental. This year you’ll notice many changes in the Con Suite but one of the biggest is that it will no longer be open past bar time. Friday 6 p.m. to 11 p.m.
Saturday and Sunday 8 a.m. to 11 p.m.
Monday 8 a.m. to 1 p.m.
As usual, it will be closed during Opening Ceremonies, the Tiptree Auction, and the Dessert Salon. Stop in to say hi and see how we’ve changed! Smoking is prohibited everywhere in the Concourse and in all restaurants and bars in Wisconsin. In Madison, this ban includes all types of electronic cigarettes. The Concourse’s smoking area is outside the double doors to the left of the front desk beyond the Sundries Shop. State Street has at least two smoke shops and last this diva knew there are at least a couple places downtown where you can sit outside and indulge in a hookah. Less a headline and more a statement of fact, our Access Team works hard every day to make sure you are able to navigate the con safely regardless of your level of ability. From the unscented soaps in the public restrooms to the remote viewing room at the Dessert Salon, they’re working every day to make the con accessible to as many people as possible. If you have difficulty navigating the carpeted area next to the elevator bank on the first floor, use the blue-taped path to the right of the grand staircase past The Cupboard Under The Stairs™ (previously the business center) and around the far side of the elevators. We have a sharps disposal container available for your use in the nongendered restroom next to Registration. If you need a personal sharps container, they are available in the hotel’s Sundries Shop next to the front desk for $3. Did you know there’s an accessible, nongendered restroom on the 6th floor next to 629? I didn’t until today! We’ve also got one on the second floor to the right of Registration. Blue tape, it’s everywhere! Blue-taped areas and chairs in programming rooms are for those who use mobility devices or who may need to sit near the front for whatever reason. Blue-taped lanes in the hallways show you which side of the hall is for walking or rolling and which side is for hanging out. Blue tape can also indicate where lines should form. I may be able to manage my own interactions, but can I take a decent picture? Nope. Sorry, folks! Interaction badges! If you sometimes have trouble interacting with people, we’ve got your back! RED (stop sign symbol) means: STOP don’t talk to me! I don’t want to talk to anyone right now, or if I do, I will approach you. If I initiate conversation, it’s ok to talk back. YELLOW (triangle symbol) means: I only want to talk to people I know, not to strangers and not to people I only know from the internet. If I initiate conversation, it’s ok to talk back, but please don’t approach me unless you know me. GREEN (circle symbol): I would like to be approached by people interested in talking. I may have trouble initiating conversation. WHITE (square symbol): I can manage my own social interactions. How can we help make the convention more accessible for you? You can always contact us at access@wiscon.info. Sure, we posted that information to Twitter and hashtagged it, but that was, like, an hour and 200 tweets ago. Let this be your virtual corkboard! We’ll archive announcement and informational tweets as we make them. Look for this post in the sticky posts on the right side of the blog. Con Suite this year features many vegetarian, vegan, & gluten-free items. Reminder: Safety is even available in the middle of the night. Do not hesitate to call the Safety number in the PPB at ANY TIME. Anne of Safety models their yellow vests. If you have any Safety concerns, please find someone in a hideous vest. "Which departments need volunteers?" "ALL OF THEM!" Con Suite is closed for opening ceremonies. GO TO OPENING CEREMONIES!! Ballroom, 2nd floor. You learn useful stuff! Con Suite closes at 7:30pm for Opening Ceremonies. 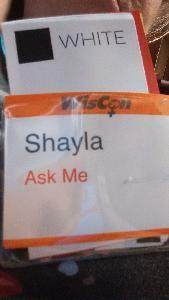 Is this your 1st WisCon? Come to 1st WisCon Dinner! Meet outside the Wisconsin Ballroom @ 5:15 & join WisCon veterans at local restaurants. 2) EatStreet.com has given us 10% off through 5/25 with code WCON10. Good for any order! 1) @MsnConcourseHtl offers a discount card for the hotel restaurant (NOT good in Starbucks): for $10, you get 20% off during WisCon! Have clothes or nail polish for the swaps at The Gathering?? They are setting up & available for drop-offs! Go to 2nd floor ballrooms! Program Book errata: Childcare is in room 634!! Children’s Programming is across the hall in 629! And if you have questions about anything, the Reg Desk (2nd floor) doubles as Information. Or stop anyone with “Ask Me” on their badge! Everyone at #WisCon39 knows there’s an app for that, right? WisSched gives you a virtual program, can auto-import your programming schedule. So you have a thing you need to know about the con and you don’t know where to go? The first thing you can do is check out the Welcome To WisCon! hand-out on the table by the elevator banks across from Registration. If it’s not there or just isn’t enough info, you can check the Pocket Program Book. Still can’t find it or not enough? Ask at Registration or, if nobody is at the desk, find anyone with a badge that says Ask Me at the bottom. They’re members of the concom and happy to answer your questions. 1 p.m.: The Gathering starts in the Wisconsin Ballroom. Childcare opens. 2 p.m.: Dealer’s Room opens. 6 p.m.: Con Suite scheduled to open. Dealers’ Room closes. Childcare closes. 7:30 p.m.: Opening Ceremonies. Important announcements, skits, cash bar, what’s not to love? 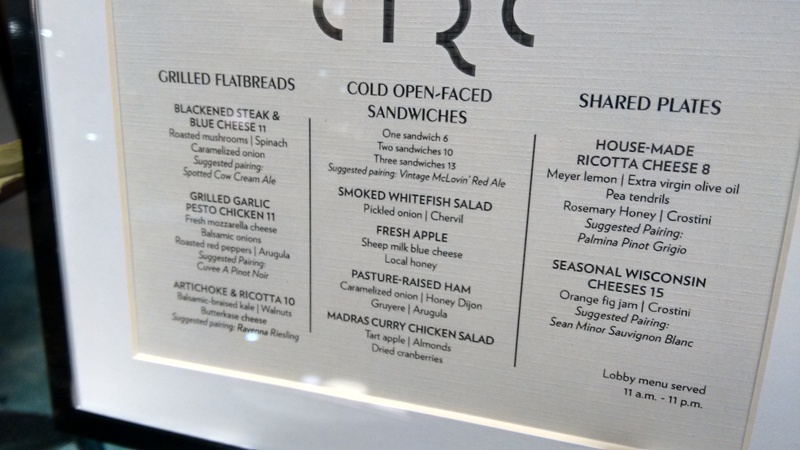 CIRC’s delicious menu of flatbreads, sandwiches, salads, soups, and shared plates can be yours for 20% off with the purchase of a discount card. See the front desk for more details! Here’s a behind-the-scenes thing you may not know. Each year, the hotel staff and concom members sit down the Wednesday before the con starts and go over every detail of the convention to make sure we all provide you with the best possible experience. We go over the layout of every room for every function, the specialty drink menu from the bar… pretty much every interaction we have with the hotel and hotel staff. The best part? There are snacks. What better incentive to volunteer your time? Pool hours have been extended! The pool is open from 5 a.m. to 1 a.m. for the duration of the convention. As part of the beautiful remodel, the ATM that was previously on the first floor near the bar has been relocated to the second floor coat closet which is currently behind the Reg Desk. You are welcome to use it, especially if you plan to spend some of that cash in our Dealers’ Room or Art Show! A truly scintillating picture of the new carpet in the hotel lobby. If you use a mobility device and find this difficult to traverse, just take a left and follow the blue-taped path to get to the elevators. 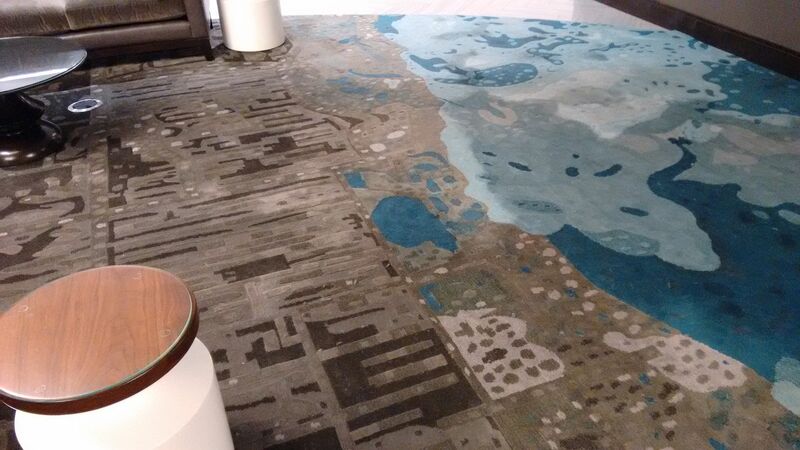 And speaking of the remodel, have you checked out the carpet in the lobby? I can see my house! And since they’ve just redone it from top to bottom, they’ve asked that we no longer tape posters anywhere on the first floor. Bulletin boards and pins are provided for your announcements. Trouble navigating the hotel’s parking ramp? Park in front of the hotel and check at the bell desk. A staff person will be happy to park your vehicle for you. Reservations for next year open Suday at 9 a.m. You can make them online, by telephone, or at the front desk. Check back tomorrow for more details! That’s because WisCon is run by volunteers. Everyone from the president of SF3, our parent organization, down to the person who picks out desserts for the Dessert Salon (which would be me, by the way) is a volunteer as is every moderator, panelist, Con Suite attendant, bake salesperson… pretty much everyone. The only paid positions, in fact, are the childcare workers. There are many, many opportunities to join in the fun whether you have time at-con or at home. We are always recruiting. At-con you can check out the Volunteer Board near registration then contact volunteer@wiscon.info. We need people with all sorts of experience to do all sorts of things. If you see something that suits you and volunteer your time, you can earn a beautiful commemorative book with a story from each of our Guests of Honor. If you give us at least 6 hours of your time, you can also earn a $20 refund on your membership. At home, you can check out blog.wiscon.info/open-concom-positions/ then contact recruitment@wiscon.info if anything listed for WisCon 40 tickles your fancy. You’ll see the phrase “Safety first!” here and there around the convention and that’s because our Safety team is one of the first lines of defense against trouble that may arise. They’re also your go-to for any help you may need if you feel unsafe. Safety team members wear neon vests and circulate throughout the hotel. You may see them peeking into panels or moving through parties. If you need help, look for a Safety team member or, of course, make your way to Registration or the Front Desk. If the situation is urgent, please dial 911. This year, we have a secure report form online at http://goo.gl/forms/fQJNSiDpE3. The information you enter on this form will be shared only with the parties absolutely necessary to resolve your issue. If you have any questions or concerns, please contact safety@wiscon.net. And if you want to help keep the con a safe experience for everyone, we desperately need safety volunteers. If you volunteer for a shift during the Dessert Salon to help take tickets or wrangle the line, you’ll get your choice of desserts and reserved seating!